Running her own paper cutting business meant Rachael Bennett was able to make all her own exquisite stationery and table decor for her own wedding. Rachael married Michael Dunne, from Longridge, at Georgian House Lancaster Register Office on March 30 before a reception at Willow Barn at the Bay Horse Inn in Lancaster. High school sweethearts, the couple met in 2009 at Longridge High and have been together since. They have two children, Oliver and Emmie and became engaged when Michael got down on one knee at the top of Arthur’s Seat in Edinburgh during a trip for Rachael’s 21st. Their big day dawned with preparations, cake assembling, champagne and a vintage campervan to take them to the ceremony. 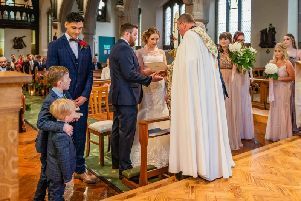 Rachael said: “The ceremony began at 3.30pm. Hanna carried Emmie down the aisle first and I followed with my dad to “Old Pine’ by Ben Howard. “This is our favourite song from his album which we listened to on repeat when we were younger and touring Rhodes on a quad bike. Photographs and a confetti shower followed before the happy couple headed to the reception for in the stunning gardens with sun shining on the fields. During the evening, the little ones enjoyed a children’s disco before the evening reception began as some children were being picked up and taken home. Michael, 25, an air conditioning and refrigeration engineer said: “The wedding day was perfect in every way. “Rachael had worked so hard to make everything herself and had really thought about the style we wasnyted and was a great way to keep costs down.